A cement factory linked to the Myanmar government is said to be endangering an ancient Buddhist site by blasting the nearby mountains for material without regard for the relics housed in the cave. Mining work by a Burmese government-owned cement factory is destroying ancient Buddha images and votive tablets in a cave near Hpa-an, capital of Karen State, according to historians and local residents. The Kawgun caveâ€”a natural lime stone cavern, 200ft high and 300ft longâ€”is located near a village of the same name, two miles from Hpa-an. It contains many images and artifacts that historians say date from the Pyu era, spanning the period from the first century to the ninth century AD. Thanks for your fine site — I have added a link to this story on BAN. It’s sad to hear of such ignorant destruction. One hope from the tragic cyclone may be that outside help can open up the country to the world and encourage cultural respect. I have been 4 times there. This is one of favorite archaeological site in Historical sites of Myanmar. In Hpa-an area or Kayin state have many many Buddhist Cultural caves. But the dating is 15 to 18 century AD around. 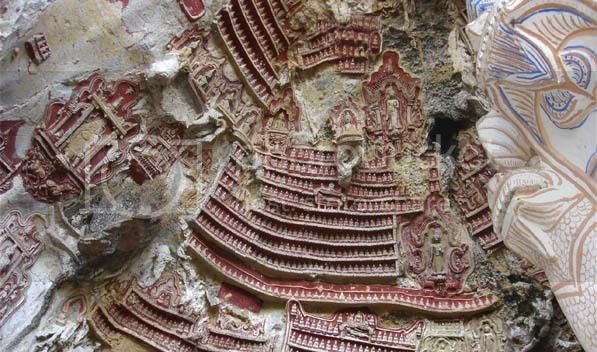 Kawgun cave is also 15-16 century AD and we can see numerous Buddhist Terracotta (votive tablets)and images in there. Some are made with gold and decorated by painting (use red, yellow ocher and green). Myanmar Archaeological Department were have the large conservation and protection project in 2000. I thinks a cement factory production is really big problem for ancient relics. I went to Kawgon in Feb, fascinating place. You need to read Yuzana’s master thesis.On the opinion of Yuzana it is not so old.